When is a pasty not just a pasty? When it’s a metaphor for class divide, of course. In literature, symbolic objects transcend their physical limits to embody themes or carry metaphors. Pandora’s Box, to take a very obvious one, is not only a functional, fundamental element of the story but also a powerful metaphor for the confusion and chaos released by curiosity. It’s an integral element of the myth but it also carries meaning beyond its origin story. As news stories run and run, twisting and turning often in far more fanciful ways than any fiction, sometimes these sorts of symbolic objects turn up. My favourite for a long time now has been the duck house, made famous during the MPs’ expenses scandal. More so than any of the other ludicrous things paid for by MPS out of their expenses, the duck house came to symbolise the lavishness, the detachment from reality and the sheer unadulterated silliness of the whole affair. It’s hard to sum up all of that with a news story, or even with a pithy quote, but a symbolic object can do the heavy lifting that no amount of text can quite manage. The duck house even manages to subtly imply a bunch of waddling, quacking MPs into the bargain. It’s a gift that keeps on giving. Then a couple of weeks ago we had the horse. Phone hacking as a news story has gotten so convoluted and complex that it’s impossible for anyone but the most dedicated news junkie to follow in full. There’s a (necessarily) slow-moving inquiry that hasn’t yet brought politicians into the picture, and there’s an ongoing feeling that the cosy relationships between principle actors in the drama are not going to be publicly revealed. Hence, the horse: a wonderful symbolic proxy for power, passed back and forth between the police, the Brooks family and Cameron himself. Horsegate played out in microcosm the larger drama, with denials, memory lapses and an eventual, half-hearted confession after which precisely nothing changed. It was a gift for cartoonists, too, especially in its connotations of servility – and a physical reminder of the closeness of Cameron in class and in pastimes to the Chipping Norton set, and the vast chasm between that and most of the rest of the country. So today, to the pasty. It’s not a sausage roll tax or a hot food tax; it’s a pasty tax. A regional delicacy beloved of workers and students, both of whom have been walloped pretty hard since the coalition came to power. It’s a working lunch, a travelling lunch, a cheap, hot lunch eaten on the go by busy, normal people. It’s sustenance for hard days. 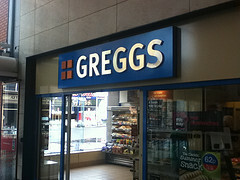 In its Cornish origins it has subtle echoes of resistance, of regional pride; it’s determinedly non-London, as is Greggs, which has its origins in Newcastle. Greggs is on every high street; it’s well loved for what it does; and it’s almost impossible to imagine Cameron or Osborne there. It is no coincidence that these symbolic objects are all about class. British national discourse is fairly bad at talking about class, thinking about class, examining unspoken opinions or getting a good sense of the realities of social stratification. The definition of “middle” class has vastly expanded and encompasses everyone not wearing a tiara or a hoody. But the duck house is so far out of everyday experience that it can’t be packaged as anything other than a symbol of wealth. Horse riding is a pricy pastime that carries Victorian, upper-class connotations. And the humble pasty is something an awful lot of people have eaten in the last few years – the sort of people who’ve been hit badly by the economics of austerity. The sort of people who aren’t Cameron. These things surface an undercurrent, a class divide that doesn’t often get publicly debated outside of riots-based moralising. That we latch onto these symbols shows how hard it is to talk about class, equality and social mobility in the UK without resorting to stereotype or self-delusion, especially at present, when the optimistic view is that we are all headed for difficulty. Almost everyone is braced for the worst, counting pennies, fearing redundancy or more price rises. We are all so terribly nervous about what happens next. We have to have a pasty to focus on instead. This is the second of (I hope) four posts coming out of the Powerful Voices roundtable I attended earlier this month. The first was a resource-dump for concepts we discussed there; the third and fourth will tackle major issues raised. This one is about the divide between digital haves and have-nots, and what the future looks like for connectivity. Back in Norwich, the newspapers where I used to work have just launched a campaign to back a bid for better broadband. Areas of rural Norfolk suffer badly from a lack of coverage – businesses relying on connectivity to function, to process payments or to do work, find themselves crippled by slow or unusable broadband access. Mobile coverage can be patchy. 3G is a luxury. There is an ongoing fight for change. It can be very, very easy to forget that not everyone is online. When everyone around you is eyeballs-deep in social media and those without smartphones are a rarity, the statistics on digital inclusion are startling. According to the ONS [pdf], 27% of UK households have no access to the internet at home, and 9.2m adults have never used the internet. Those figures are likely to fall. But they’re likely to fall faster in areas where broadband speeds are high, where there is free internet access for those who can’t afford a home connection, and within certain demographics – people who can afford smartphones even if a home broadband connection is out of reach, for instance, or young people in house shares who can split the costs of connection if not of hardware. For some rural communities, fast broadband is unlikely to come from the telephone companies. Despite promises to the contrary, a fair few Norfolk businesspeople are bitterly aware that telecoms giants go where the profit is – and that means not laying cables and updating infrastructure in areas where the usage wouldn’t pay for the work to be done. And that profit motive has other unpleasant effects. The fight for net neutrality is being fought much more loudly on the other side of the Atlantic – but it’s a growing issue in the UK too. The introduction of a tiered system in which those who can pay get their websites served faster than those who can’t threatens the free proliferation of information across the net, and threatens to limit access still further for those who can’t pay. The internet has democratised processes of creation and dissemination; any move towards a tiered web will move us away from open access; and the future for net neutrality in the UK remains unclear. Already there are communities everywhere taking matters into their own hands. The Open Rights Group is one of several organisations fighting to protect net neutrality and working to protect other digital rights. Remote Cumbrian villages are raising money and building their own broadband networks. And it is technically and technologically possible to share your wifi connection with your neighbours – and to drop free wifi networks over wide areas, like the (now sadly defunct) network that blanketed Norwich with free connectivity a few years ago. But we’re not there yet. Any project tackling social change – like the ones rising out of Powerful Voices – has to consider the implications of the digital divide, whether they’re trying to solve the problems it creates (by replacing lost library services with online access, for instance) or trying to use digital methods to influence issues that also affect those who find it difficult to get online (like volunteer schemes for the unemployed, or community projects looking for professionals). It was fascinating and eye-opening that the suggestions that struck home with the Powerful Voices crowd were not so much the online ideas – they already knew they needed to be where their communities are, use whichever social networks they already use, and fragment their work across multiple platforms to reach people. It was the offline thoughts that got a big response. One idea, that if your community hangs out in a coffee shop then you should go put some flyers there for your project, prompted a discussion about how difficult it is sometimes to remember that there are offline ways of connecting with people, too. There are still ways of reaching and empowering people in remote communities who aren’t online. And local newspapers are still one of those ways. The physical, newsprint paper finds its way into houses where the internet does not; its distribution networks, though they are under threat, already work to put it in the hands of physically and socially isolated people. It’s a symbol, a mark of social belonging, and a link to the wider world. Local papers can and do campaign for their communities, using their established clout and power to fight for what’s right for them. That means, sometimes, a newspaper fighting for something that could threaten its bottom line – when what matters to its readers is something that could indirectly mean the print paper’s circulation falls. Better broadband and connectivity isn’t going to mean an immediate sales drop – but as more and more remote communities come fully online, the need for the newspaper as a wider community champion link will decrease. Who can work for free? Since Arianna Huffington sold the Post to AOL, there have been lots of posts on all sides of the debate about whether bloggers working for free is a good thing, a bad thing or simply an unavoidable thing. It’s true that many HuffPo bloggers arecelebrities or working people or other types who pure and simple don’t need pay, who do it for the platform. But more are unpaid, community bloggers who write for love, for dedication, and in some cases in the hope that their work for free is a gateway, a way to build their profile and to end up with a paid writing gig. No one’s forcing them to write for free. But to me this issue seems to fit neatly into a continuum with a free guest post on one end and months-long unpaid media internships on the other. Media and writing careers are desirable; people want a way in; editors want a portfolio of cuttings; the only way to get one is, often, to work for free. Online or off. And that means that media diversity shrinks. There are thousands of aspiring, talented writers who can’t afford to work for nothing but expenses paid; hundreds of students who have to earn money during their summer breaks and can’t take time out to go do unpaid work experience. Very few people can afford to be a journalism entrepreneur or start up a hyperlocal blog, and genuinely spend the time and the money and the energy involved in covering their community well, when there’s rent and utilities and bills to pay. Further down the line, what about those who can’t afford to drift from freelance paycheck to freelance paycheck, with no sick pay or holiday or job security, in the hope of getting something more permanent? Do they capitulate, go over to much-derided “content farms” like Demand Media or Suite 101 just to get some writing credits and try to earn money at the same time? Or do we lose those voices from the conversation because of the economic barriers to entering a media career? I’m not saying that the HuffPo can or should solve those problems. But I do think they’re problems that need thinking about when we think about paying writers – because if media businesses don’t pay people with no experience, we’re guaranteeing that the people with experience will be a certain type of people. And that, in the long run, means a poorer public dialogue and a skewed view on the world. Posted on February 15, 2011 July 20, 2018 Categories Metamedia, PoliticalTags class, unpaid workLeave a comment on Who can work for free?